Born in Brooklyn, NY, rapper-actress Cheryl James is better known as "Salt," from Salt-n-Pepa. They were the first female rap act to have gold, platinum, and multi-platinum albums, and the first female rap act to win a Grammy Award. James has done musical projects with others, but also has appeared on-and-off with Pepa (aka Sandra Denton). 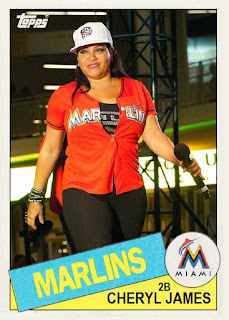 It was their joint appearance at a Marlins game that got them both on Celebrity Jersey Cards. The "Pepa" of Salt-n-Pepa is Sandra Denton, a Jamaican–born American hip hop artist/rapper and actress. Like her Salt-n-Pepa counterpart James, Denton has performed with others, but always returns to the act which gave her the most notoriety. Like James, she bends the time continuum on her Celebrity Jersey Card which would have been released prior to the existence of the Marlins.